Yorktown, IN — Renovations to downtown Yorktown’s Canal Street are set to begin within the next few months, the Yorktown Redevelopment Commission announced. These renovations include widening the streetscape and installing sidewalks that are compliant with the Americans with Disabilities Act. These improvements will allow for a more walkable and accessible downtown area for all Yorktown residents, said Matt Anderson, the president of the Yorktown Redevelopment Commission. “The goal for the downtown revitalization project is to reinvigorate the downtown district by creating population density through the enhancement of new commercial, residential, social and recreational activities,” Anderson said. The Canal Street upgrade is the first step in the larger downtown project, which focuses on four main principles, according to the redevelopment plan: creating a social and economic hub for the town, developing a “destination” downtown, appealing to multi- generational residents and establishing a unique “culture” within the town. Town Manager Pete Olson said the upgrades planned for downtown will help attract and maintain businesses, which would boost the town’s economic sustainability and expand its commercial tax base. Click the image above for a larger view. The redevelopment plan would also allow more opportunity for community events and the addition of amenities. The enhancements might also increase property values for Yorktown residents. Plans for the downtown project began as early as 2014, when the Yorktown Redevelopment Commission first invited members of the public to open houses and town hall meetings to discuss residents’ desires for downtown. The commission hosted multiple meetings to which the public was invited, and the town council officially approved the downtown redevelopment plans at a public town hall meeting in December 2017. The approved plan included the Canal Street improvements and the construction of a new bridge. After the plans were approved, the redevelopment commission held additional public meetings, including one in August 2018, which included open forums where members of the public were invited to provide constructive feedback as the project moved forward. 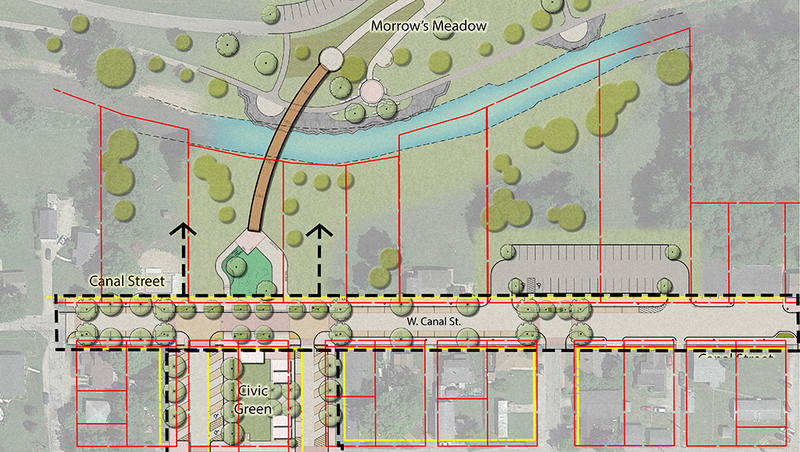 The new bridge will connect Morrow’s Meadow to downtown, allowing for easier access to both areas during community events and increased foot traffic to local businesses. According to the approved plans, the bridge’s downtown landing will be located between Plum and Vine Streets. No eminent domain has been used to obtain property for the construction of the bridge. In fact, the town has provided impacted property owners offers that would allow the residents to continue living in their homes for the remainder of their lives. According to the economic impact analysis, the downtown redevelopment plan is expected to generate nearly 200 jobs and, over the course of 10 years, contribute approximately $150 million in economic activity. This surge in economic activity will impact not just Yorktown, but all of Delaware County. To learn more about Yorktown’s downtown development plan, visit yorktownindiana.org. The Yorktown Redevelopment Commission is composed of six members and was created to make maximum opportunity for rehabilitation, redevelopment or economic developments of areas in Yorktown. Its primary purpose is to finance projects for the betterment of the community by designating TIF districts in order to capture taxes of new development for the use of constructing these improvements that help benefit the community.